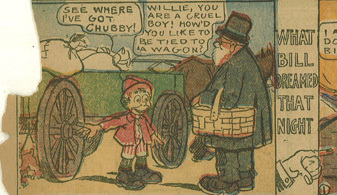 Here’s a great turn of the last century obscurity called The Bad Dream that Made Bill a Better Boy by William Steinigans… the format would appear to be a blatant rip off of Little Nemo. There are some other examples of this strip I noticed in an amazing book I need to get a copy of one of these days, The World on Sunday : Graphic Art in Joseph Pulitzer’s Newspaper (1898 – 1911). Read about William Steinigans on Lambiek.net here.